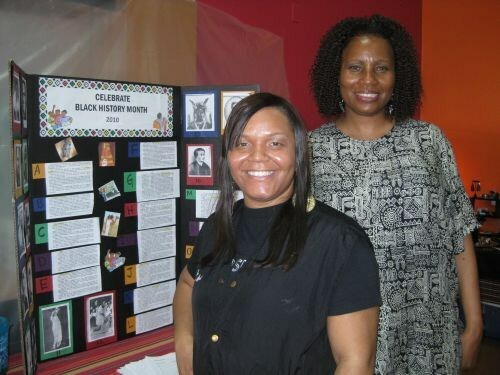 The Glamour Spot co-owner Debra “DJ” Jessie (right) and esthetician Michelle Rhem-Collins pose by a “Celebrate Black History Month” contest board set up for the salon’s Black History Marketplace & Spa Day. The board asked clients to match prominent black historical figures’ names to their biographies, and one of the completed entries was given a prize. Whether on purpose or just by circumstance, beauty salons have always served a function as public gathering spaces to talk about the issues of the day. So I was happy to find out that a local salon was hosting its Second Annual Black History Marketplace & Spa Day in honor of Black History Month as a way of getting the community together, selling some beauty and fashion-related products, and getting the word out about spa services. I stopped by the event — which was held from 11 a.m. to 6 p.m. on a Sunday — to take in the scene at The Glamour Spot in Carson, Calif., and to chat with co-owner Debra “DJ” Jessie. ‘It’s a cultural thing. I wanted to bring our people together,” DJ told me. She’d asked an array of vendors — many of whom are her friends or friends of friends — to set up booths for the marketplace part of the event. They were selling everything from lotions to candles to shoes to “I Am Black History” t-shirts. She and other estheticians at the salon, plus massage therapists, offered facials for $45, and chair and foot massages for $1 a minute. She also arranged for two tables of complimentary refreshments. To get members of the community in, DJ mailed out about 1,000 flyers to the salon’s mailing list, sent out evites, and posted the event on Facebook. Each vendor also provided 25 names to which flyers could be sent, and the salon’s stylists helped spread the word as well. “I like the energy in here,” commented masseuse Rebekah Bell, who participated in the event for the second year in a row. I was impressed with the event and with how it raised awareness for an important occasion while also promoting the salon. Does anyone else know of any Black History Month events at your or neighboring salons?